We focus on bringing you the most satisfactory party bus service experience on your wedding, which happens to be one of the most special events in your life. With our stylish, fully equipped wedding party buses serving people in New Jersey and neighborhood, we can recommend which fleet is perfect for your transportation. It takes more than premium quality wedding party bus limousine service to exceed customer’s expectation all the time. You can expect exactly the same from our EWR NJ Limo service company as we want to create an exciting mobile party experience for every customer. Our limo rental policy is to make everybody’s wedding party transportation memorable. Our fleet of wedding party bus limousines is wide and gives you an option to choose one depending on your preference and guest list. We offer wedding Party Bus limousines matching your budget. Our professional, friendly and experienced chauffeur will assure that you won’t face any problem during the wedding transportation process, and he can drive you and your guests safely to the proposed wedding venue with additional facilities of drinks, music, lighting and more. 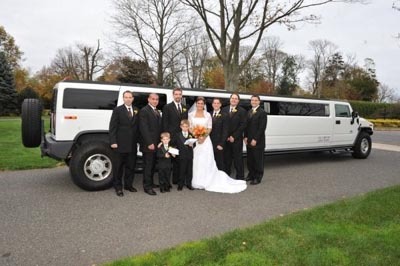 Contact us and ask for a better fit wedding party limo rental package which could bring you an ultra luxurious travel experience on the day of your wedding in NJ. Once you choose our NJ wedding party bus limo rental service, our specialists will help you in finding the most appropriate party bus limousine for carrying your guests. We will also answer any queries you may have regarding our wedding limo features or price and give some recommendations to improve your party bus limo transportation experience on every special occasion. To book your wedding party bus with assured luxury and comfort, contact us today!